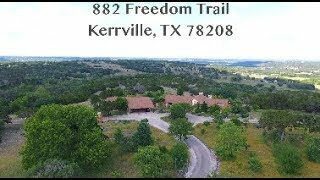 Over 66 ag-exempt acres w/ gorgeous views, wildlife, lg tank, and luxury of peace & quiet. Meticulously maintained custom built home w/ Austin stone & cedar exterior. Open floor plan w/ high ceilings, spacious bedrooms, sun room & study. Perfect home for intimate gatherings or hosting lg parties. Island kitchen w/ stone & wood countertops made of 100+ yr old long-leaf pine from a Dublin flour mill. 2 wood-burning fireplaces. Sep bldg. w/ guest room, full bath, 650 sf craft, 400 sf workshop & 3-car port. 460+' Trinity well. 1500 gal rain water catchment. Open pasture and wooded land. Must see!